Dental implants have been around for over 30 years, and due to their great success rate, have become the gold-star option for replacing missing teeth. Surgically placed, your implants become integrated into the jawbone. 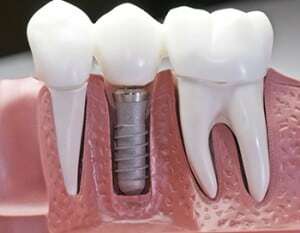 Titanium dental implant bases serve as the tooth roots, with abutments being screwed into the implant bases so that the crowns can be attached, and replacement teeth being fitted on top. The result? New teeth that unlike dentures, do not require removal, and which feel and work like natural teeth! The dental implant procedure involves two-phases, but first, we recommend you choose a highly-trained, reputable dentist – like Dr Michael Cai of our Sydney Pitt St Dental Centre – who regularly performs dental implants, and who uses a quality brand of implant. During your initial appointment, Dr Cai or an associate will take x-rays to ensure there is adequate bone and soft tissue. Healthy gums are also essential for the implant procedure, and note that the sooner you have the implant done after an extraction, the better. In Phase 1 of the dental implant procedure, an incision is made into the gum tissue and the implant is inserted. To complete Phase 1, the gum tissues are closed and you will be given 3-6 months to heal, and to allow a strong implant base to form. Once your dentist is confident that the healing phase is complete and your body has accepted the implant, Phase 2 of the procedure begins. This involves an abutment (the supporting structure for the replacement tooth) being secured to the top of the implant, and a custom-designed crown being positioned onto the implant abutment. No matter the number of teeth you need replaced, dental implants are an option; we offer single-tooth and multiple-tooth dental implants, both administered with the Phase 1 and Phase 2 implant procedures. For individuals requiring a full arch of teeth, removable full arch implants are available as well. Post-implant care is an important part of the procedure and should not be disregarded. Stick to a soft food diet (we suggest foods like yoghurt, porridge, bananas and soups), as chewing hard foods may rupture your crown/s. Smoking should also be avoided to ensure implant success. Remember to visit us every 3-4 months for appropriate care and follow-up, and once healed, look after your implants as you would your regular teeth with daily brushing and flossing. Short on time but want to make an appointment for dental implants? Sydney professionals will find Pitt St Dental Centre is located conveniently in the CBD, meaning you can pop in for your appointments before or after work. Did we mention we offer payment plans? Call us now for your free consultation!